Diamond Cut Design: Stand out from the rest with a Three Dimensional diamond cut design extending from the front bezel to side panel. RGB Lighting Effect: The included RGB controller connects three pre-installed RGB fans and an RGB power button to create an amazing lighting effect. Acrylic Side Panel: Show off your build through the unique shaped edge to edge acrylic side panel with special lighting effect from different angles. Covers For Clean Build: An additional cable cover takes cable management to the next level. Assemble clean builds like a pro! Graphics Card Support: Equip yourself with the latest graphics card up to a length of 407mm for your cutting-edge system build. 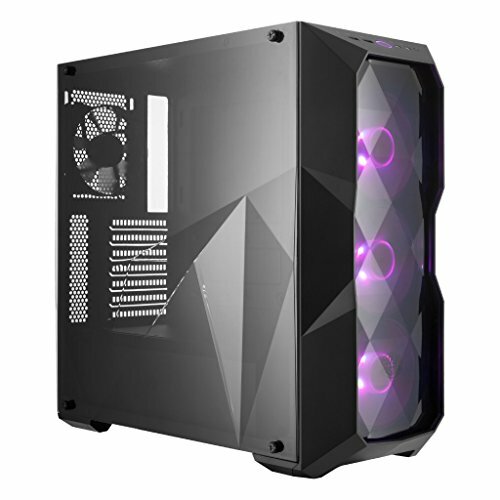 If you have any questions about this product by Cooler Master, contact us by completing and submitting the form below. If you are looking for a specif part number, please include it with your message.